A serif-style CJK font goes by many names: Song (宋体) in Mainland China, Ming (明體) in Hong Kong, Macao and Taiwan, Minchō (明朝) in Japan, and Myeongjo (명조) or Batang (바탕) in Korea. The names and writing styles originated during the Song and Ming dynasties in China, when China’s wood-block printing technique became popular. Characters were carved along the grain of the wood block. Horizontal strokes were easy to carve and vertical strokes were difficult; this resulted in thinner horizontal strokes and wider vertical ones. In addition, subtle triangular ornaments were added to the end of horizontal strokes to simulate Chinese Kai (楷体) calligraphy. This style continues today and has become a popular typeface style. Design of ‘永’ (‘eternity’) in Noto Serif and Sans CJK. This ideograph is famous for having the most important elements of calligraphic strokes. It is often used to evaluate calligraphy or typeface design. It respects diversity of regional writing conventions for the same character. The example below shows the four glyphs of ‘述’ (describe) in four languages that have subtle differences. 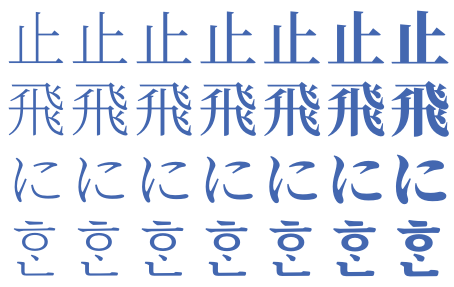 From left to right are glyphs of ‘述’ in S. Chinese, T. Chinese, Japanese and Korean. This character means “describe”. It is offered in seven weights: ExtraLight, Light, Regular, Medium, SemiBold, Bold, and Black. Noto Serif CJK supports 43,027 encoded characters and includes 65,535 glyphs (the maximum number of glyphs that can be included in a single font). The seven weights, when put together, have almost a half-million glyphs. The weights are compatible with Google’s Material Design standard fonts, Roboto, Noto Sans and Noto Serif(Latin-Greek-Cyrillic fonts in the Noto family). It supports vertical text layout and is compliant with the Unicode vertical text layout standard. The shape, orientation, and position of particular characters (e.g., brackets and hiragkana letters) are changed when the writing direction of the text is vertical. 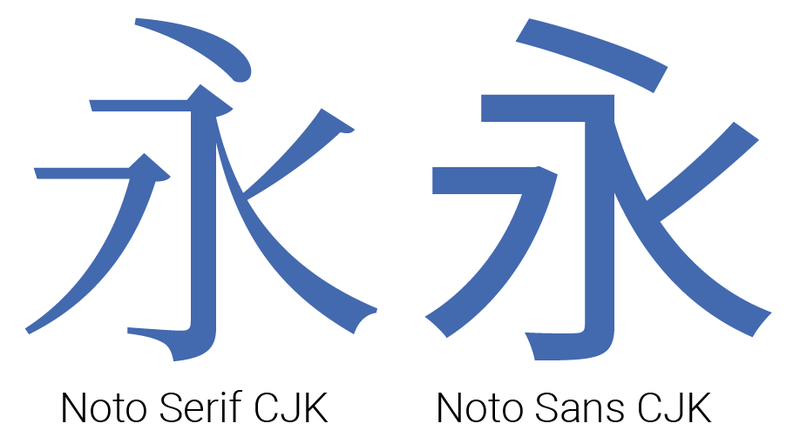 Source: Noto Serif CJK is here!